Ellen Voie is an internationally recognized speaker and authority on gender diversity and inclusion for women working in non-traditional careers in transportation. She has been invited to speak to audiences in Sweden, Australia, New Zealand, Viet Nam, France, Mexico, and Canada in addition to being a popular speaker at conferences throughout the United States. As founder of the Women In Trucking Association in March of 2007, Voie currently serves as the nonprofit organization’s President/CEO. 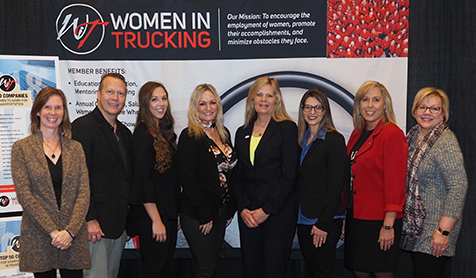 The Women In Trucking Association was formed to promote the employment of women in the trucking industry, to remove obstacles that might keep them from succeeding, and to celebrate the successes of its members. Voie’s prior role was the Manager of Retention and Recruiting Programs at Schneider, Inc. She was responsible for creating corporate-level programs to encourage non-traditional groups to consider careers in the trucking industry and designed initiatives to eliminate (or reduce) irritants that lead to driver dissatisfaction, which ultimately affects turnover. She also was responsible for communication to drivers (newsletter, audio magazine and driver website). From March of 2000 through January 2006, Voie served as the Executive Director of Trucker Buddy International, Inc., a pen pal program between professional drivers and elementary students. She had served on the Board for three years prior and had become familiar with the program and its mission, and under her guidance the organization grew to become an internationally recognized mentoring initiative. Voie’s background in the trucking industry began as the assistant and later Traffic Manager for a steel fabricating plant in central Wisconsin. She then worked as a dispatcher for a grain hauling carrier before becoming co-owner of a small fleet. After starting a family, she used her background to become a freelance transportation consultant to carriers in Wisconsin, licensing and permitting trucks for more than 16 years. Voie earned her diploma in Traffic and Transportation Management in 1980 from LaSalle Extension University. In 2005, Voie earned the Certified Association Executive (CAE) credential from the American Society of Association Executives, the leading authority in association management and a professional society for the association industry. In December 2008, she attended Tri-C Truck Driver Academy in Cleveland, OH to earn her Class A Commercial Drivers License (CDL). Voie earned her Master’s Degree in Communication from the University of Wisconsin, Stevens Point, where she completed her Thesis research on the complex identities of women married to professional drivers. In 2015, she completed the Strategic Leadership program at the Smeal College of Business at Penn State. In 2018, Voie completed the Finance for Strategic Decision Making program at the Smeal College of Business at Penn State. Voie also completed the Women In Trucking Professional Development Certification. In July 2012 she was honored by the White House as a Transportation Innovators Champion of Change. She received the 2015 “Distinguished Alumna of the Year” award from her alma mater, the University of Wisconsin-Stevens Point Division of Communication. Voie also was named one of Supply & Demand Chain Executives magazine’s “2016 Pros to Know,” which honors select supply chain executives who are leading initiatives to help their clients, companies, or the supply chain community at large to prepare for the significant challenges in the year ahead. In May 2016, she was chosen as one of Fleet Owner’s Dozen Outstanding Women In Trucking. In 2017 Voie was named to Insight Success Magazine’s “The 30 Most Inspirational Leaders in Business” and "The 30 Most Innovative CEOs To Watch." In 2018, Voie was named by "Beyond Exclamation Magazine" as one of the "Top 10 Shepreneurs through the Glass Ceiling and Beyond," as well as was named the National Association of Small Trucking Companies (NASTC) “Transportation Person of the Year.” In 2019, Voie was named Aspioneer Magazine’s “2018 Flying High Women Leaders." Voie is the recipient of the Skinner Humanitarian award, presented annually to a trucking advocate in her state. In 2014 she was awarded the Frank W. Babbitt award from the Wisconsin Motor Carriers Association. This annual recognition is given to an individual who has demonstrated outstanding service to the trucking industry and association as a whole. In her effort to promote the trucking industry to the public, Voie helped found and organize Trucker’s Pride Day in Waupaca, Wisconsin, which grew to include thousands of visitors to this annual truck show. She convinced Governor Tommy Thompson to proclaim the event as a statewide “Trucker Appreciation Day” in Wisconsin. She also worked as an advocate for women married to truck drivers. She assisted in promoting and expanding the Families of Trucker’s Support Group, where she was active in providing a network for women who felt isolated because of their lifestyle. In 2015, Voie was appointed to serve a two-year term on the FMCSA’s Entry Level Driver Training Advisory Committee. She serves on the Board of Directors of the Wisconsin Motor Carrier Association and is a member of the Wisconsin DOT’s Motor Carrier Advisory Committee. She was involved in adapting the Wisconsin Driver’s Manual to include information on sharing the road with trucks. She also has served as chairwoman of the ATA Safety and Loss Prevention Council’s Recruiting and Retention committee and on the ATA Image and Communications Committee. Voie served as President of Mensa of Wisconsin/Upper MI from 2010-2014. She also served on the Mensa of Wisconsin Foundation during that time. In 2013 she was elected to the board of directors of American Mensa and served as the Regional Vice Chair for two years. She serves on the board of directors for Transport for Christ International. She has also served on the Saint Christopher’s Fund board of directors and the Truck Writers of North America board of directors. Voie currently serves on the board of directors for the National Transportation Center where she is the Vice Chair. Voie has written extensively about trucking and family issues, and her articles have appeared in print and internet magazines. She has also published a book, Marriage in the Long Run, a collection of some of her most popular columns. Her most recent book, Crushing Cones, was written to provide potential drivers with information on what to expect when attending driver training school. In addition to these, she created a workbook for professional drivers and their families which assists the driver’s family in coping with the time and distance apart. From city life in L.A. to country living outside of Nashville, Herndon has accumulated more than 25 years of experience in a myriad of positions and industries in business development, sales, public relations, publicity, and marketing and communications. Her unique blend of experience and knowledge brings creative strengths, excellent communications skills, and diverse knowledge to the clients she serves. She began her career as a publicist in L.A. and promoted such projects as Michael Jackson’s “We Are The World” and the Kennedy’s pet project “The Special Olympics.” A move to a small town in west Texas put her in the newspaper industry. She was hired by a local daily newspaper as a writer and was quickly promoted to Lifestyle Editor, Religion Editor, and columnist. Not only were several of her feature stories picked up by the Associated Press, she also received numerous writing awards for her stories and columns. She moved to Nashville where she worked as a publicist for country music artists, then at The Tennessean for 10 years in Creative Services. She has worked as the Marketing and Public Relations Director for Southern Shows, Inc.; Marketing a Sales Director for Cardiovascular Risk Assessment; and worked as an account executive in B2B sales for Sysco and Ricoh Business Solutions, and as a loan officer for Magna Bank and Sellers Financial Group. In 2010, she was hired as Vice President of Business Development for MindShare Strategies, a full-service marketing and management firm that specializes in the transportation and logistics industries. There, she was involved in member services and sales for critical accounts for the firm, including NASSTRAC (the National Shippers Strategic Transportation Conference) and the Transportation Marketing & Sales Association (TMSA). She now solely focuses on member services, conference sponsorships and exhibit sales for the Women In Trucking Accelerate! Conference, and sales of advertising for the Redefining the Road magazine. Char Pingel has worked for the Women In Trucking Association since its inception in March 2007. From 2002-2007, Pingel served as Executive Assistant to Ellen Voie at Trucker Buddy International. She matched drivers and teachers in this pen pal organization; created the newsletters, brochures, and flyers; answered phone calls and letters; and attended truck shows. Pingel worked at the University of Wisconsin-Stevens Point for nearly 25 years. She managed a gift store and hired/trained over 300 students. Her work also included desktop publishing of The Interpreter’s Handbook Series (five books). She and her husband (an owner-operator) have been married since 1973. They have two children, one grandson, and two granddaughters. Lana Nichols is Director of Programs for the Women In Trucking Association. She has been with WIT since May 2013 and is responsible for accomplishing project objectives set forth by the WIT Board of Directors. Prior to this position, Nichols spent nearly five years with Truckstop.com in New Plymouth, ID where she held the position of Product Manager and Technology Department Manager. During her tenure, she managed employees that consisted of software engineering, database administration, quality assurance and product development. She was also a member of the implementation team that successfully adopted the scrum methodology into the Tech group. Her experience with project management along with her implementation record make a positive contribution to the Women In Trucking Association. Nichols received her MBA from Eastern Illinois University. She was raised in southern Illinois and currently lives in Idaho with her husband, Marcus, and their three children. Karen Everett is skilled with numbers, statistics and data, and has an analytical mind to make sense of it all. With more than 25 years experience in administrative and executive management support roles, she’s able to put those skills to good use on behalf of the Women In Trucking Association, a major client of MindShare Strategies. (a management and marketing firm that specializes in transportation and logistics). Everett is an instrumental resource in leading such projects as Customer Relationship Management (CRM) strategies, establishing online surveys through MindShare’s research tools, and providing all client reporting on financial budgets and project billing. She’s skilled in all Microsoft Office software products, troubleshooting problems and leveraging technology at various levels of projects in a business environment that is built around Microsoft Office products and software-as-a-service (SAAS) platforms. She and her business partner/spouse, Brian Everett, launched MindShare Strategies in 1997 and have grown the firm into a successful marketing enterprise. Previously, she worked as Office Manager at Ridgeview Business Health Services, in accounting and financial management roles with Holiday Companies and the University of Minnesota, and as a legal assistant at Callahan Gorman & Woodford. Robert G. Rothstein is of counsel to Seaton & Husk, L.P. a transportation law firm with offices in Vienna, VA, and Nashville, TN. He serves the legal, legislative, regulatory, and business interests of motor carriers, household goods movers, private carriers, and logistics providers. Rothstein received his undergraduate degree in finance from the University of Miami; his J.D. from the Shepard Broad Law Center at Nova Southeastern University; and his L.L.M. in Labor Law from Georgetown University. He is admitted to practice in New York, Pennsylvania, and Virginia, and is also admitted to practice before several federal district courts and circuit courts of appeal. Rothstein’s practice is devoted cargo claim litigation, regulatory matters before the Federal Motor Carrier Safety Administration, and matters involving licensing, registration, and taxation of motor carriers by federal and state jurisdictions. Rothstein serves as General Counsel to the Virginia Trucking Association. His civic involvement includes pro bono legal representation of trucking industry organizations Women In Trucking Association and Trucker Buddy International. He maintains a valid Class A Commercial Drivers License and logs at least one cross-country trip each year behind the wheel of an eighteen-wheeler. He’s got a reputation as the “go-to guy” for marketing in the transportation and logistics industry. That’s because he has more than 25 years marketing, communications, and sales experience in transportation, warehousing, and logistics, with a special expertise in business strategy, B-to-B marketing, and association management. As Senior Partner of MindShare Strategies, Everett regularly provides marketing counsel to the firm’s key accounts. He is particularly well-connected to shippers as the former Executive Director of the National Shippers Strategic Transportation Council (NASSTRAC). Currently, he serves as the Chief Executive Officer for the Transportation Marketing & Sales Association (TMSA), and also provides strategic counsel for the Women In Trucking Association. Everett also was Director of Marketing for C.H. Robinson for 10 years, and helped transform this low-profile company to one of the most widely known brands in the third-party logistics market when it went public in 1998.